The island of Rab and the homonymous city are located on the northern Croatian coast in the Adriatic Sea. The island is 22 km long and has 9480 inhabitants. The highest peak is Kamenjak, 408 m high. The northeastern side of the island is mostly barren, karst, while the southwestern side is covered in one of the last oak forests of the Mediterranean. The island of Rab was first mentioned in a Greek source 360 BC by the name Arba. The name belonged to the Liburnians, the oldest inhabitants of the island. 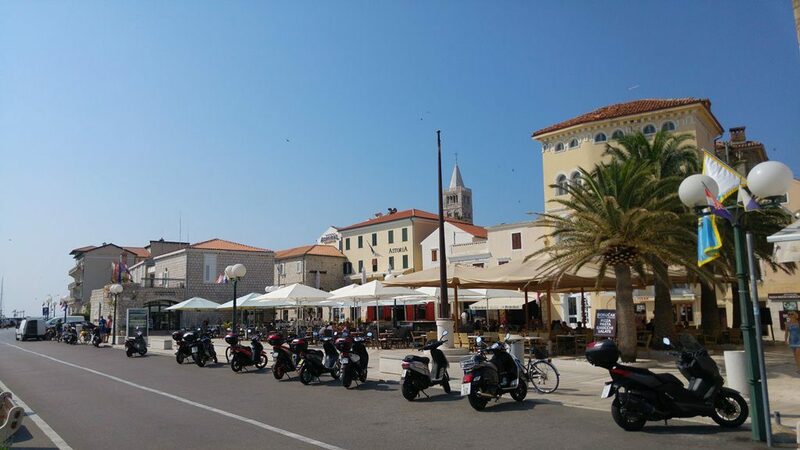 Arba was also the name of the Liburnian settlement in the modern city of Rab. The Illyrian-Liburnian word Arb meant “dark, obscure, green forested”. Palit: Lungo Mare – here you can find pedal boats, kayaks, restaurants, showers and public toilets, the Banova villa beach. Banjol: the shallow sandy coves of Padova 2 and Padova 3 and the beautiful seaside promenade are suitable for small children. Next to the restaurant Banjol is another pebbly beach. Kampor: the tourist village Suha punta (rocky beaches, crystal bays), Mel (sandy beach), in the village centre, in front of the diving centre (gravel beach). Barbat: The Pudarica beach – cca. 3 km outside the village offers even a nudist section, a few small beaches Lungo Mare (gravel). Supetarska Draga: in the lower Supetarska Draga there are two sandy beaches, Gonar (sandy coves), below the upper Supetarska Draga (rocky beach). 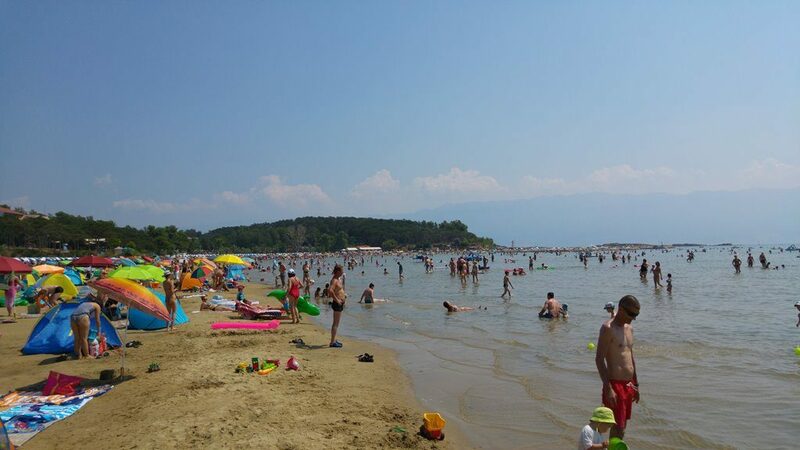 Lopar: Lopar is well known for its sandy beaches, there is also a beach in the Lopar bay, the most popular beach of Paradise, the beach Livacina, the other beaches in Lopar are nudist beaches. 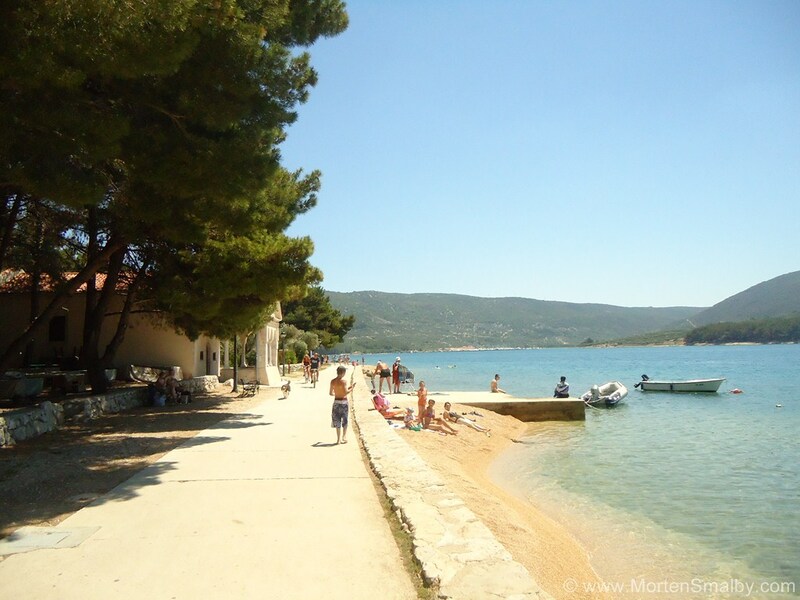 Town of Rab: the beaches “Ban villa” and “Vela Kamen”. The island of Rab offers all kinds of high-quality accommodation from numerous hotels, camps, boarding-houses, villas to apartments and rooms in private houses. Most of the hotels and campsites that can be found in Rab belong to the large hotel Company Imperial. But there are also several small and large hotels which are newly renovated. Some of the well known hotels in Rab are the four-star Carolina Hotel Rab or the three-star Padova Hotel Rab. Since tourism became one of the main income sources in Rab, the people of Rab invested a lot in the renovation and construction of the hotels. There is also more and more private accommodation in Rab like holiday villas, apartments or rooms which can be rented. That is why the range of accommodation becomes better and various every year. Besides the already mentioned campsites of the Imperial Company, there are also the Campsites San Marino and Zidine in Lopar and the campsite Padova III in Banjol. The Campsite Padova III is a three-star campsite and it is known as one of the best campsites in Croatia. The newly renovated campsite is located in a pine forest with its own 500 m long sandy beach. Up to 1500 guests can find place in the campsite which offers bicycle, boat, banana rides and para-sailing, as well as morning jogging sessions, a diving centre and diving school. Rab is a perfect destination for lovers of history and historical sights since the town has a long history that dates back to 360 BC. In Rab there are many churches which can be visited, the biggest one is St. Mary the Blessed which was build in the 13. century. The beautiful cathedral delights not only as a beautiful building, but also with its amazing location. Inside the cathedral is a small museum. Other interesting churches to visit are the Church of St. John the Evangelist and the church of St. Anthony. When you are in Rab you should also visit the ruins of the fortress. 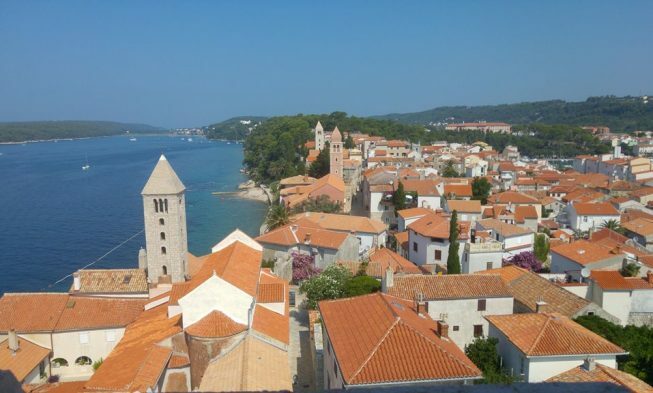 The most beautiful sight is the old town of Rab itself, with its numerous Gothic and Renaissance palaces, churches and characteristic four belfries. The integrity of the town in form of a ship with its famous four belfries attracts tourist from all over the world. In the beautiful, narrow streets and medieval alleyways you can feel the typical Mediterranean spirit. From 25 – 27 July, Rab celebrates its patron – saint Christopher with the St. Christopher’s Fest and a knights tournament and a medieval Festival. In August there is another Knights tournament. During the summer months there are many happenings in the town, like summer Musical evenings, classic musical concerts, art exhibitions… There are also many folk’s fests during the summer months, which are very interesting for the tourists as they are a perfect opportunity to see all the traditions of the inhabitants. From Rab there are organised daytrips by boat which you can join either alone or in a group. 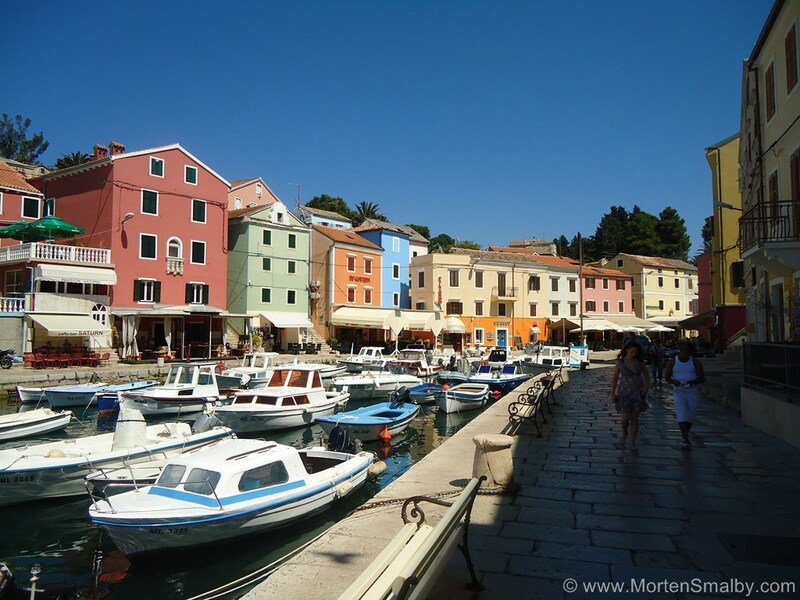 In these organised day trips by boat you can visit other islands like Losinj or Pag. You can also join an excursion on a little roundtrip around the island of Krk where you visit Zavratnica – Goli –Baska. 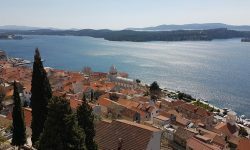 There is also the possibility to do a roundtrip around the island of Rab; this kind of excursion is usually organised on Sundays. From Rab there is also an offer which includes the visit of the national park Northern Velebit which is the youngest of eight Croatian National Parks and it is special for its exceptional diversity of karst formations. Another excursion offered from Rab is the one to the national park Plitvice Lakes, the most popular national park in Croatia which is, because of its natural beauty of the lakes and waterfalls, visited by tourists from all over the world. The traditional lifestyle of the inhabitants of Rab which includes fishing and agriculture is also visible on the menus of the restaurants of the island. Loads of fresh fish and fresh, organic vegetables can be found in almost every restaurant. During your stay in Rab you should not miss to try some of the local wines, like the Cabernet Sauvignon made by the family Staničić which has been rewarded with different prizes. Taverns can also be found in Rab; there you can try different traditional and home made dishes prepared with locally produced ingredients. There are even two ACI Marinas in Rab. One is in Supetarska Draga and the other one is in Rab town. 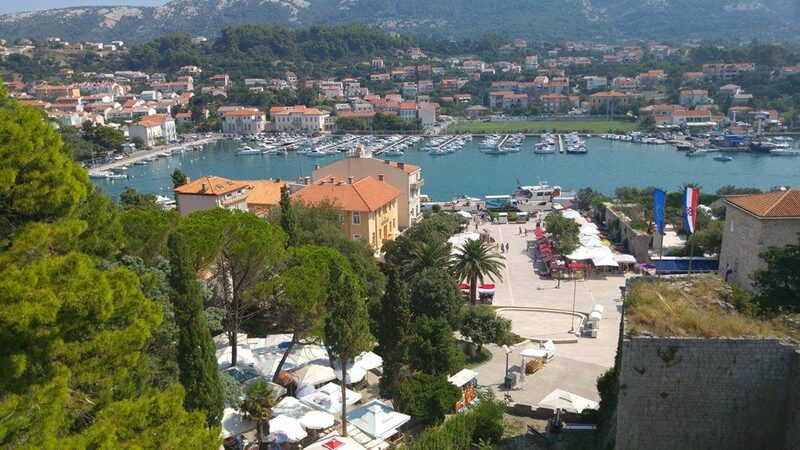 The Marina in Supetarska Draga offers 40 berths and the big one in Rab 142 berths all of them have water and power supply. In the facilities of the Marina in Rab there is a reception desk with an exchange office, a café bar, a restaurant, a beauty salon, a food store and many other things. The whole marina has a WLAN internet system. There is also a petrol station next to the marina. In Rab you can find plenty of little local supermarkets where you can buy food and things you need in your everyday life. Of course there are also quite a few souvenir shops in Rab. For a bigger shopping you have to go the mainland and visit one of the cities along the coast. During summer there are always many happenings in Rab; beside the entertainment in town like the medieval festival there are also many bars and beach bars. One of the most popular places is the beach club Santos, every summer many Croatian and foreign artists perform there. Traveling by plane or train you have first to go to Rijeka and then you can continue your journey to Rab. Regardless of which means of transport you choose, you have to combine them with a ferry. (ferry prices you can see here) The ferries you have to take are either Jablanac-Mišnjak or Valbiska-Lopar. You also have a catamaran from Novalja on Island Pag and a small passager boat from Lun.